Folding laundry, near and dear to every mother's heart. This little competition between my brother and I has turned into a contest to see who has the most dull life. I think I'm winning. I bet my Tide on it! While I was putting away my laundry I felt it was far time to clean up our closet. Just kidding! 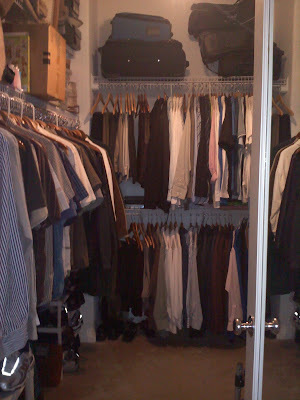 Obviously, this is Jason's closet from Day 3. I told you he was a neat nick! Isn't his closet beautiful? Shoes in a row. I own one wooden hanger. But Jason has rows of wooden hangers with clothes sorted by color. You'll never find that in my closet. And you'll never find girl clothes in Jason's closet! Don't forget to tune into The Jason Show today. He promised something more entertaining than pictures of his drive home. He promised his audience Rome. That's way better than laundry. Nothing wrong with a happy kid in his jammies @ 5! I just hate you both for your massive closets. Today is laundry folding day. We're starting to forage through hampers of wrinkled, clean clothes. Your closet looks like more fun. Anytime there's a kid in footie pajamas involved, there's some interesting things going on. Have you ever gotten caught up on laundry? I did once back in the spring of 1997. And I promptly took our huge retail store wire pillow display turned hamper OUTside into the spring flowers and took pictures. The best one I enlarged, framed, and hung on the wall in my laundry room.